to help locate displaced individuals, and more recently we’ve started projects to spur economic recovery in the affected areas, such as the “YouTube Business Support Channel,” which enables local businesses to promote their products and establishments to a nationwide audience. We also believe that the Street View feature in Google Maps can be a useful tool to offer street-level imagery of the recovery efforts. Many photographers felt the disaster couldn’t be captured in just one photo or with a single camera, but immersive, 360-degree panoramic images can help people — especially those abroad — better understand the scope of the destruction. On July 8, we announced that we’ll be driving our Street View cars across major cities (such as Sendai) and coastal cities of the Tohoku region to not only help communicate the current state of the disaster-affected areas, but also to digitally archive the area’s landscapes for future generations. This imagery will help people in Japan and across the world remember and observe the tragedy of March 11, 2011. In addition to preserving history through Street View, the team in Japan has been busy publishing 360-degree imagery of more than 100 famous sites across Japan through our Street View Partner Program. 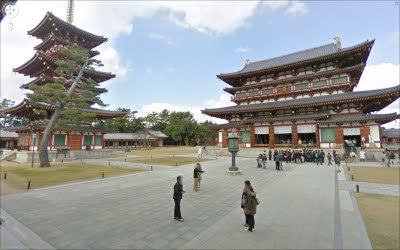 The places that have partnered with us to share views of their locations on Google Maps include UNESCO world heritage sites Yakushi-ji temple, Toshodai-ji temple, and Kasuga-Taisha shrine in the ancient capital city of Nara. We’re also continuing the Business Photos project in Japan and are working with hundreds of businesses to photograph their interiors, get those images online, and show both local customers and visitors that they are open for business. If you’re interested in directly supporting the ongoing relief effort in Japan, you can find more information regarding the disaster and resources for those in need at our Crisis Response page in English and Japanese. After the March 11 earthquake and tsunami devastated the coastal communities of Eastern Japan, we at Google tried to find ways to use our technologies in support of relief activities. This started immediately after the quake with our Person Finder to help locate displaced individuals, and more recently we’ve started projects to spur economic recovery in the affected areas, such as the “YouTube Business Support Channel,” which enables local businesses to promote their products and establishments to a nationwide audience.